I always have a cupboard crammed full of homemade condiments, jars of spicy pickles, piquant relishes and chutneys made from ripe summer fruit and vegetables at the height of the season. I make my own because I like to know exactly what they’re made with, ingredients that are a bunch of numbers scare me, but mainly I make my own because they taste much better. Our obsession with condiments doesn’t end there though, we love mustards too. At any given time you’ll find at least four varieties in our fridge, but sadly none are home made. 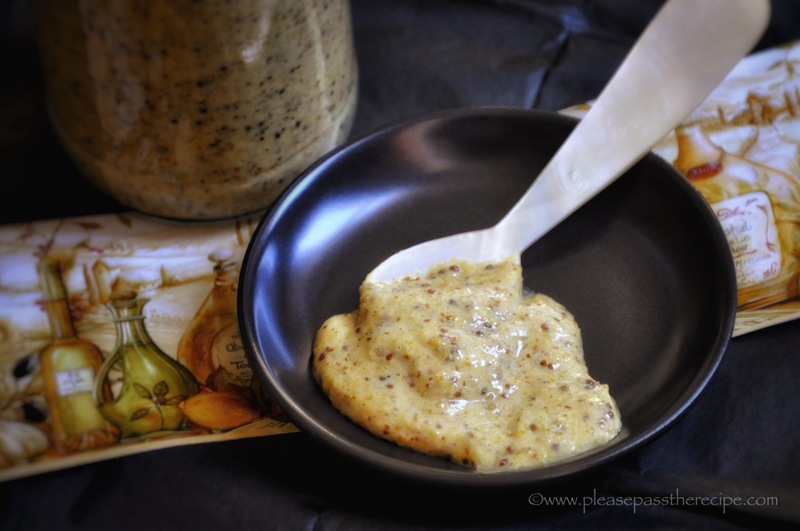 A few weeks ago Gretchen @ “FeedingMy3Sons” posted a very tempting recipe for Beer Mustard. Her list of ingredients was short and already on my pantry shelf. It was just a matter of measuring a few ingredients allowing them to soak overnight, adding a few more things then whizzing the whole lot together in the food processor. At first I was unhappy about the texture of my mixture, it hadn’t homogenised and Gretchen’s photo showed a thick and creamy mustard, so I continued to run the processor. After just a short time the mixture began to thicken but still maintain the look of grainy mustard. Gretchen’s Beer Mustard is so good that I won’t be replacing the commercial mustards in my fridge when the jars are empty, we now have a much better homemade product. I used Coleman’s hot English mustard powder to add a delicious sharp bite to the flavour. So far we have relished Gretchen’s Beer Mustard with sausages, made a killer vinaigrette for green salad and used it to add a burst of flavour to a potentially dull potato salad. Soak the yellow and brown mustard seeds together overnight in the beer and vinegar. The next day tip the mixture into the jug of a food processor then add the mustard powder, salt maple syrup, horseradish and pepper. Process the mixture until thick. This recipe sounds like a winner, Sandra. I made a similar mustard and loved it, although I’ve stopped preparing it in favor of a GF and alcohol-free version of honey mustard. I’ve friends and family with dietary restrictions. Even so, nothing says that I can’t make some of yours and just not give it away. Hehehe. Once you taste this John you’ll be keeping it all for yourself…. This looks fabulous Sandra! Is it hotter than a French whole grain mustard? My Mum would put hot English mustard on our tongues if we used a rude word (only ever happened once to me!) so still a bit wary of anything that packs too much of a punch… Love the idea of making my own though. Hope you have a lovely Easter. Thanks Margot. Yes grainy dijon is mild in comparison, it has the bite you get from hot English mustard though it’s not got the full on heat. You may be able to buy a milder powdered mustard, Keen’s perhaps. Coleman’s is about as hot as they get. If you can handle wasabi you’ll be OK with it…. So glad you were able to make one you liked! I wonder if it’s because I used my high power blender that it emulsified quicker. It does make a great vinaigrette and good on sausages. I also like it with chicken, basically everything! This looks so good!! I’ll have to try it with sausages! Have not made my own mustard for quite a time and am certain none of my ‘brews’ have been as exotic in ingredients: do not remember maple syrup or horseradish but surely would like to try! Used some of ‘that’ Masterfoods stuff yesterday and was totally disenchanted, so this is on the list for the Easter break – have a good one! Now that sounds killer and its GF as well! Have to add the missing bits to my shopping list. I use a lot of mustard and this looks beaut. It’s a terrific bitey brew Cheery, enjoy…..
That looks amazing! Can I check though – 1/4 cup of Colman’s English Mustard powder? That sounds like it would blow my head off – but hubby would be happy! OK I trust you. I’ll report back. I don’t have fresh horseradish but I think I will manage without it! Reporting back! It packs a PUNCH and I’m so glad you said to keep going with it because I thought it was going nowhere and was about to give up. Thank you! This entry was posted on March 23, 2016 by ladyredspecs in Food and tagged beer mustard, dairy free, gluten free, homemade mustard, low fodmap, mustard.